Former Caption of Pakistan Cricket Team and Indian Tennis Star Sania Shoaib expecting first child. Shoaib Sania first Child will have surnamed “#MirzaMalik”. 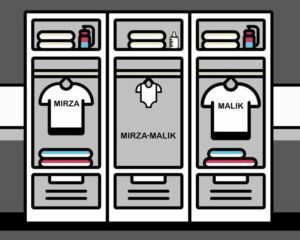 They announced on the twitter by sharing a cute wardrobe picture of three cabins respectively for Sania, Shoaib, and Baby. The former Pakistani cricket captain Shoaib Malik was got married to the Indian Tennis star Sania Mirza 8 years ago. Love knows no boundary and this is well proven by Shoaib Malik and Sania Mirza. Beyond the dispute of both the rival countries, they make their married life successful. Many people spread the rumors about their separation. But Sania Mirza silenced the rumors with her powerful statement. The couple was being criticized by the fans of both countries but they had already decided to remain together.After their marriage people were anxiously waiting for Junior Malik. After a long time, Sania, Shoaib expecting first Child and share the news on social media. On Twitter account, both Shoaib Malik and Sania Mirza shared a cute wardrobe picture about 6:00 PM on 23rd August regarding Sania, Shoaib expecting first Child. Both celebrities shared the post at the same time. The news becomes viral in just hours. The wardrobe consists of three sections. The first one was reserved for Sania, the second one for Shoaib Sania first child and the third one for Shoaib. They are unique and use a unique way to inform about the good news. Their way of sharing the news is really praised by the fans. In fact, whole social media sites are filled with this post. Some are congratulating them while others are criticizing. No one is even sure about whether it’s a baby boy or girl not even this couple share about this.But for sure, it’s going to be a royal child of Asia. We wish best of luck to this lovely couple and pray for their safety and health.